By CNN'S PRISCILLA ALVAREZ, GENEVA SANDS AND KATE SULLIVAN CONTRIBUTED TO THIS REPORT. (CNN) - Former White House chief of staff John Kelly and the other four former secretaries of homeland security sent President Donald Trump and Congress a letter Wednesday calling for full department funding and an end to the month-long partial government shutdown. 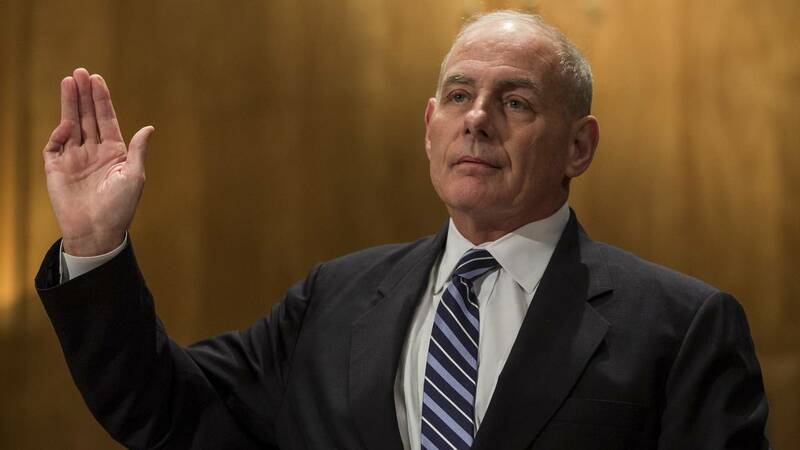 "As former secretaries of the Department of Homeland Security (DHS), we write to you today with a simple message -- fund the critical mission of DHS," wrote the bipartisan group of Kelly, President George W. Bush alums Tom Ridge and Michael Chertoff, and President Barack Obama alums Janet Napolitano and Jeh Johnson. Kelly, who left his White House role just as the shutdown began, derided the border wall at the center of the funding battle during an exit interview last month, telling the Los Angeles Times, "to be honest, it's not a wall." Kelly continued at the time, "The president still says 'wall' — oftentimes frankly he'll say 'barrier' or 'fencing,' now he's tended toward steel slats. But we left a solid concrete wall early on in the administration, when we asked people what they needed and where they needed it." In their letter Wednesday, the former secretaries cited the historical precedent of Congress prioritizing funding agencies such as the Department of Defense as a matter of national security. "Congress does so because putting national security at risk is an option we simply can't afford," the group wrote. "DHS should be no different." As federal employees face their second missed paychecks Friday, some have turned to food pantries to make ends meet. While they were "heartened" at the community support for both furloughed and essential employees -- those required to work during the shutdown -- "this cannot and should not be the answer," the group argued, citing how members of the Coast Guard are legally barred from quitting or pursuing other full-time employment. "DHS employees who protect the traveling public, investigate and counter terrorism, and protect critical infrastructure should not have to rely on the charitable generosity of others for assistance in feeding their families and paying their bills while they steadfastly focus on the mission at hand," they added. "This is unconscionable." The group also warned of a large scale brain drain from government employees leaving for the private sector, as "the Department is facing a real crisis in retaining this workforce week after week." "We call on our elected leaders to restore the funding necessary to ensure our homeland remains safe and that the Department's critical national security functions continue without compromise," the letter concludes. On Thursday, Johnson said "from a security standpoint we are letting our guard down," and warned a breaking point for federal workers may come on Friday when they miss a second paycheck. Johnson said the "very people we depend on for security are made to suffer," and noted that for years the US fought high attrition in the Secret Service and said he fears "this shutdown and missing paychecks are a huge setback." Johnson was speaking at an event with former senior DHS officials hosted by House Homeland Security Committee Chairman Bennie Thompson, a Mississippi Democrat.